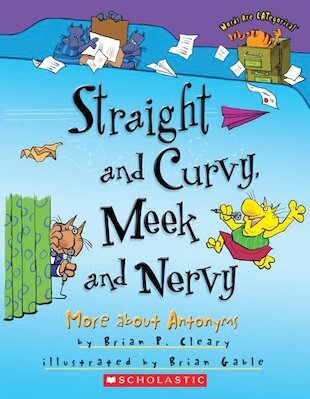 Opposites get exciting in this rhyming look at antonyms – words that are opposite in meaning. In quirky pairs, a bunch of zany (not ordinary) cats deliver loads of funny examples to illustrate the power of antonyms. Brian Cleary’s playful (not dull) verse and Brian Gable’s comical (not serious) pictures make a rhyming game of grammar, guaranteed to educate and entertain. Each pair of antonyms is printed in colour for easy (not difficult) identification. Read this bright, zippy book aloud and delight in the sense and nonsense of its playful pairs!